M.N. : Those FSB security guards by the embassies are not in a position to determine if the visitor "was a spy or not", they just carry out their superior's orders. This pattern of attempted intimidations and provocations against the diplomats generates a deep sense of disgust for this recent style, which is apparently consistent with the other policies, of the Russian "diplomatic line" of Intelligence Services, specifically the FSB. These actions, some of them - criminal, have a smell of the fascist degeneration. What is Mr. Lavrov's response? Look into this, Mr. Putin! It is a shame! To say the least. In the early morning of June 6, a uniformed Russian Federal Security Service (FSB) guard attacked and beat up a U.S. diplomat who was trying to enter the the U.S. Embassy in Moscow, The Washington Post reports with reference to four U.S. officials. According to the WP journalist Josh Rogin, the previously unreported attack occurred just steps from the entrance to the U.S. Embassy complex. The diplomat suffered a broken shoulder, among other injuries, but then flown out of Russia to receive urgent medical attention, the author states. The State Department in Washington called in Russian Ambassador Sergey Kislyak to complain about the incident. The motive for the attack remains unclear, Josh Rogin says. Spokesmen for the both the State Department and the CIA declined to make a comment on the incident or whether or not the diplomat was in fact an undercover U.S. spy. If the U.S. diplomat attacked on June 6 was not a spy, U.S. officials have no other explanation for why the FSB guard was trying to stop him from entering the embassy, the journalist sums up. In his recent investigation into the issue, Josh Rogin states that Russia keeps harrassing U.S. diplomats all over Europe saying that such acts ‘range from the weird to the downright scary’. Giving the reason for the U.S. poor response to such barbaric behaviour, the investigative journalist quotes the members of Congress involved in diplomacy with Europe who put it down to Obama administration’s attempt to project a veneer of positive U.S.-Russian relations that ‘doesn’t really exist’. Secretary of State John Kerry last discussed the matter with Russian President Vladimir Putin on March 24, according to State Department spokeswoman Elizabeth Trudeau. "We see an increase and we take it seriously," she told reporters at a press briefing. Trudeau said that harassment of diplomats by Russian security agents and traffic police had been an issue over the past two years but did not detail any incidents nor why Kerry brought up the matter with Putin. Other Western embassies had reported the same behavior toward their diplomats stationed in Moscow, Trudeau added. , including breaking into the homes of embassy personnel and moving around contents. Moscow, however, has charged that Washington has also engaged in problematic behavior. Last week the Russian Foreign Ministry Spokeswoman Maria Zakharova said that Moscow has "felt a significant increase in pressure on the Russian Embassy and consulates general of our country in the United States." According to Zakharova, staff members of Russia's consulate missions abroad "regularly become the objects of provocations by the American secret services, face obstacles in making official contacts and other restrictions," including travel. Trudeau dismissed Russia's claims of U.S. harassment of its diplomats as "without foundation" and said American diplomats are faced with same restrictions as Russian diplomats under the terms of a reciprocal agreement. Officials at the Russian Embassy did not respond to a request for comment. "Harassment of U.S. diplomats by host government services is a longstanding problem that occurs inside Russia," according to Trudeau. But she said an increase in incidents over the past several years appears to correspond to the imposition of Western sanctions against Russia over the crisis in Ukraine. The Putin-Kerry conversation came after Washington in January stripped five of six Russian honorary consuls of credentials to retaliate for harassment of its diplomats in Moscow. In response, Russia's Foreign Ministry accused the United States of provoking Russian diplomats in the United States and elsewhere. Honorary consuls are typically U.S. citizens or green card holders who perform consular services outside Washington on behalf of a foreign government. Trudeau couldn't rule out similar harassment by Russians of U.S. diplomats in other countries, but she said that she didn't have specifics of such cases occurring. ORLANDO, Fla.— Omar Mateen reached over the wall of the men’s room stall and pointed his 9mm handgun. Norman Casiano was among some 20 men and women jammed in the bathroom stall who had sought refuge from the gunman’s barrage and instead found themselves trapped with him. It was 2:13 a.m. on June 12 at Pulse nightclub. Mr. Casiano saw the gun’s black barrel and heard the shots. At 2:15 a.m., he called his parents to say he had been shot. He was one of the lucky ones. After Mateen left, Mr. Casiano fled the bathroom and escaped. Over the course of Mateen’s shooting rampage, which left 49 people dead and 53 injured, the gunman took the lives of roughly 15 people in the men’s and women’s bathrooms, including some shot after police had him cornered. 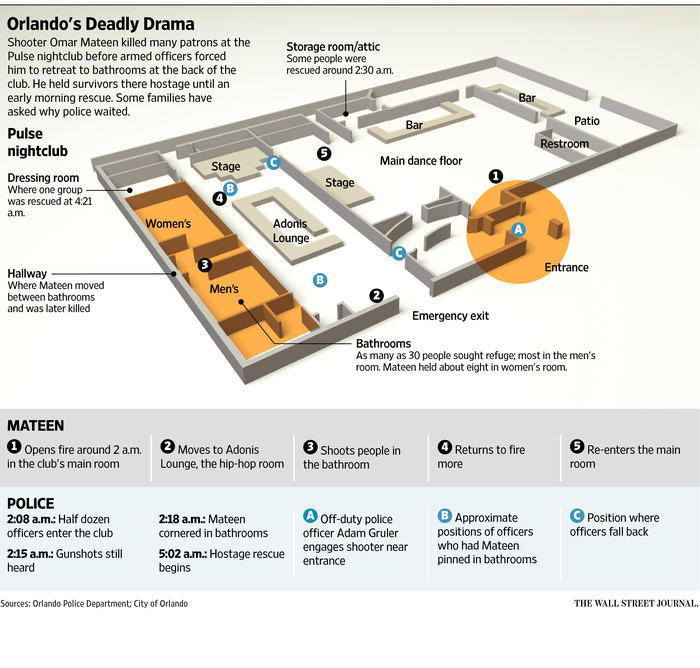 For crucial minutes after police entered the nightclub, Mateen moved between the two bathrooms, shooting people there, survivors said. Between about 2 a.m. and 5 a.m. on June 12, police were involved in a violent stand-off with Omar Mateen, the man they say shot 49 dead at an Orlando nightclub. Here's how events played out at the scene. It may take weeks or more for authorities to piece together a detailed account of the police response, especially the minutes after a half dozen armed officers first entered the club and confronted Mateen. But some survivors and family members of victims have asked in recent days why police, after cornering the gunman, didn’t raid the bathrooms right away. According to the FBI, 3 hours and 6 minutes elapsed from the time officers entered the club to the killing of Mateen during the hostage rescue, when he shot as many as three more people. “I just feel that with so many cops to one person, it should have been a little quicker,” said Albert Murray, whose 18-year-old daughter Akyra Monet Murray was the night’s youngest victim, killed in the women’s bathroom. Orlando Police Department officials said they rescued dozens of people from the club while Mateen was pinned by officers in the bathroom. “I’m extremely proud of the heroic actions of our officers and I am very confident they saved many, many, many lives,” Police Chief John Mina said at a news conference. This exclusive account of Mateen’s movements was based on recollections by more than a dozen survivors and five law enforcement officers in interviews and at news conferences, as well as an FBI timeline. Police received the first call for help at 2:02 a.m., and officers on patrol around the crowded bar scene in nearby downtown started to arrive at Pulse by 2:04 a.m. At 2:08 a.m., as many as six armed officers entered the club and found many dead and injured. Over some portion of the next 10 minutes they exchanged gunfire with Mateen, a police spokeswoman said Sunday. By about 2:18 a.m. they had cornered Mateen in the bathrooms, which were accessible only by a narrow hallway. They guarded the mouth of the hallway, guns drawn, positioned at angles several feet away. Mateen was trapped. Authorities soon learned at least two dozen people also were in the bathrooms, alone with Mateen and his rage. Their active shooter had become a hostage-taker. Mateen, 29 years old, left home that night with a SIG Sauer semiautomatic rifle, the handgun and hundreds of rounds of ammunition. Around midnight, he arrived at Pulse. Roughly 300 people were drinking and listening to salsa and reggaeton in the main room and hip-hop in another. Selvin Dubon, a 30-year-old cook from Davenport, Fla., had arrived at about 11 p.m. with two friends. They noticed a man they believe was Mateen, at a corner of the bar, scowling. The man gave Mr. Dubon an unsettling look, one of Mr. Dubon’s friends told him. Mateen left the club and returned through the nightclub’s patio shortly before 2 a.m., according to law-enforcement officials. He was standing near the club’s front entrance when he opened fire. Mr. Dubon saw the muzzle flashes. The gunman made sweeping motions with the rifle, spraying the room with bullets, as people screamed and bodies fell. “All of you are gonna die, motherf—s!” Mateen yelled, even as he appeared amused, Mr. Dubon said. Mr. Dubon dropped to the floor. He told his friend they should try to escape, but his friend worried they would be targets if they got up. Mr. Dubon took off alone, dragging himself along the ground, to a rear exit. He glanced back and saw Mateen in the VIP section of the main room, firing weapons in each hand. Mr. Dubon’s friend was killed. Adam Gruler, a uniformed off-duty police officer, was posted outside, part of the club’s routine security. He heard the shots and notified police. A police dispatcher announced: Multiple gunshots fired at Pulse. Orlando police put out a Signal 43, an all-hands-on-deck call for any officers nearby. As squad cars headed to the club, Mr. Gruler, armed with a handgun, approached the club and exchanged fire with Mateen near the club entrance. He was outgunned and retreated, according to officers who arrived later. In the club’s Adonis Lounge—a dance area and bar connected to the main room by two doors— Kraig Matthews, stage name DJ Flawless, was spinning hip-hop when he heard shots from the main room. “Fireworks!” someone shouted. Mr. Matthews dropped to the ground and rolled off the stage. A minute or two later, Mateen entered the hip-hop room shooting. Miguel Leiva, a 29-year-old welder from nearby Sanford, Fla., also saw the flashes from Mateen’s SIG Sauer rifle. He ran toward a pair of bathrooms—a smaller one set aside for men and a larger one for women—divided by a narrow hallway off the Adonis Lounge. “Everybody is gonna die!” Mr. Leiva said he heard Mateen yell as he ran toward the men’s room, a handicapped stall and a urinal. Mr. Leiva and roughly 20 others, some on top of each other, had locked themselves in the oversize stall when Mateen entered the bathroom. One woman who couldn’t squeeze into the stall pleaded, “Please, don’t kill me.” Mr. Leiva heard a shot and her body fell to the floor. A man on his knees repeatedly invoked God before Mateen shot him, too. Then the gunman shot through the door and walls of the stall. A bullet tore into the head of a woman next to Mr. Leiva, ripping off part of her face. Another bullet pierced Mr. Leiva’s foot. Two bodies fell on his leg. One man collapsed, his head landing facedown on the toilet. More than a dozen were killed. Across the hall in the women’s bathroom, Orlando Torres, a 52-year-old club promoter, hid with a friend in a stall. In the adjacent handicapped stall, Richard Aiken huddled with at least five others. Mateen entered and fired, killing a friend of Mr. Aiken. Two others were fatally shot on either side of him, Mr. Aiken said. The gunman left and fired repeatedly at prone bodies in the club, witnesses said. About 10 minutes had passed since Mateen’s first shots. 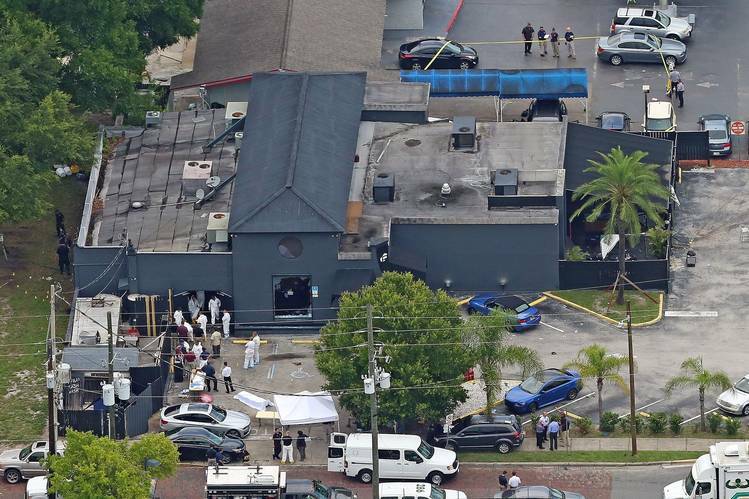 Lt. Scott Smith, a 24-year veteran and member of Orlando Police Department’s SWAT team, was one of the first officers to enter the club at 2:08 a.m. said Capt. Mark Canty, the SWAT commander. Lt. Smith and Sgt. Jeffrey Backhaus were armed with rifles and wore light body armor under their uniforms. They entered through a large window at the front of the club with four other officers, Capt. Canty said. Five of the men had SWAT training. Their goal was to stop Mateen, Capt. Canty said. What happened next remains under investigation. Lt. Smith reported they exchanged gunfire with Mateen, Capt. Canty said. Mateen returned to the men’s bathroom and shot under the stall door. “You guys aren’t dead yet!” Mateen said, laughing, Mr. Leiva recalled. “It sounded like the officers were still exchanging gunfire with the suspect,” said Oviedo Police Officer Joseph Bologna, who arrived at the club at around 2:15 a.m.
Lt. Smith and others took positions outside the two bathrooms, training their guns on the hallway between the men’s and women’s, Capt. Canty said. By about 2:30 a.m., Mateen had moved to the women’s bathroom, where he would remain with about eight people. The hostages communicated through text messages and phone calls with authorities and loved ones. “Please do not text,” Mateen told them. Phones continued to ring, some on the dead, irritating the gunman. “Hand them over,” he said. In the men’s room, some of the half dozen or so survivors were hyperventilating or throwing up at the sight of the carnage, Mr. Leiva said. Others appeared near death. “We just kept saying to people losing consciousness, ‘Don’t go to sleep.’ We kept trying to keep them up,” he said. With the gunman pinned, Officer Omar Delgado, of the Eatonville Police Department, and other officers searched the club for survivors. Dance lights flashed on floors strewn with bodies and slick with blood and spilled drinks. It smelled of liquor, gunpowder and sweat, he said. Officer Delgado saw someone alive: Angel Colon had been shot in the leg during the first barrage and the hand and hip when the gunman returned. He dragged Mr. Colon out of the club. “I don’t think I saw any patient that wasn’t shot more than once,” said Kathryn Bondani, an emergency room doctor on call that night. Inside the women’s bathroom, Mateen called 911 and pledged his allegiance to Islamic State. “I’m the shooter. It’s me,” he told a local TV station. By 3 a.m., arriving SWAT officers replaced most of the men watching the hallway to the bathrooms. They moved their position farther back. Mateen had three calls with crisis negotiators that ended around 3:27 a.m. He claimed he had a vehicle rigged with bombs. “You people are gonna get it, and I’m gonna ignite it if they try to do anything stupid,” he said. Mr. Aiken, hiding in a stall, said he sent text messages to a friend relaying what Mateen said about bombs. The friend shared the texts with police. Police and sheriff’s K-9 officers gathered across the street, said Officer Bologna, who ferried survivors from the club. He said bomb-sniffing dogs focused on a van believed to be Mateen’s. Officers began to dismantle it. A SWAT team of about 40 officers in military helmets and body armor stood watch as police leaders deliberated their next step. Police rescued one group at 4:21 a.m. after pulling an air-conditioning unit from the window of a dressing room next to the women’s bathroom. The rescued people told police Mateen said he was going to soon put bomb vests on four people, matching similar reports from hostages inside. Authorities planned to breach the wall bordering the bathrooms and force Mateen to face officers either outside or in the club, Capt. Canty said. Police tried to blow open the wall of the men’s bathroom at 5:02 a.m. They needed an armored vehicle to penetrate it. In the men’s room, pipes burst and water pooled, floating some of the bodies, Mr. Leiva said. He helped police pull out the injured through the hole in the wall. Mateen shuffled backward into one of the stalls. “Hey you,” he shouted, then shot three people, said Patience Carter, who was in a stall. The gunman then went into the hallway toward one of the holes opened by police. As Mateen fired, at least 10 officers shot at him, according to police. Capt. Canty watched it unfold by video on a monitor a block away. At 5:15 a.m., a police radio announced the suspect was down. Capt. Canty said he didn’t get a good look at him. Mateen’s body was already covered by a sheet. —Jennifer Levitz, Devlin Barrett, Lisa Schwartz and Jim Oberman contributed to this article. mikenova shared this story from WSJ.com: World News. Colombia granted its first production and export license for cannabis derivatives, in part to help employ demobilized guerrillas. mikenova shared this story from WSJ.com: World News. German Chancellor Angela Merkel confirmed on Tuesday night that the EU would extend economic sanctions against Russia. mikenova shared this story from NYT > World. If Senators vote “No” on a bill to restructure Puerto Rico’s debt, they are voting for the island’s creditors and against its people. mikenova shared this story from Reuters: World News. (Reuters) - An explosion leveled a house in a Toronto suburb on Tuesday, killing one person and injuring up to nine people, local police and Canadian media said. mikenova shared this story from Reuters: World News. OTTOWA (Reuters) - President Barack Obama said on Thursday the United States stood with the people of Turkey after the suicide bombing at Istanbul's main airport. » CIA's Brennan says expects that ISIL is plotting attacks against U.S.
mikenova shared this story from Voice of America. On June 28, the Voice of America hosted a panel discussion at the Newsuem in Washing to explore the social challenges facing Muslim Millennials in the United States. mikenova shared this story from The Moscow Times Top Stories. The Turkish government has agreed to pay compensation for downing a Russian Su-24 bomber in November last year, the RIA Novosti news agency reported Tuesday. mikenova shared this story from Radio Free Europe / Radio Liberty. The remains of two men have been found inside an exploded car in Russia's volatile North Caucasus region of Daghestan. mikenova shared this story from Stars and Stripes News. Israeli police say they have closed access to a contentious Jerusalem holy site following clashes there with Palestinians rioters. mikenova shared this story from Stars and Stripes News. Yemeni security officials say an airstrike by a Saudi-led coalition targeting Shiite rebels in the southern province of Taiz has killed 25 people — 15 fighters and 10 civilians. mikenova shared this story from WSJ.com: World News. European Union leaders are sharply divided over future EU reforms and how the bloc should approach its exit talks with the U.K.
mikenova shared this story from NYT > World. While bombings have hit Beirut and elsewhere during the Syrian war, such assaults have been rare in the area of Monday’s attack. mikenova shared this story from NYT > Europe. The same day Turkey announced a rapprochement with Israel, President Recep Tayyip Erdogan expressed regret about the downing of a Russian warplane last year. mikenova shared this story from Stars and Stripes News. When FBI Director James Comey discussed on national television the massacre at an Orlando nightclub, he made an off-the-cuff policy decision not to speak the gunman's name. mikenova shared this story from Stars and Stripes News. The original canal opened in 1914 to accommodate ships carrying as many as 5,500 cargo containers, the new locks can handle ships ferrying 13,000 such containers. mikenova shared this story from Defense News - Home. Rose Gottemoller, the State Department’s head on military issues. has been named the number two official at NATO. mikenova shared this story from Stars and Stripes News. Less than 100 additional Syrian leaders have been trained under a revamped U.S. program to fight the Islamic State group, U.S. officials said Monday. mikenova shared this story from Europe. One Russian pilot was killed when two Turkish F-16s shot down the Su-24 over the Turkey-Syria border. mikenova shared this story from World. A Swedish tourist was fatally shot while walking with his girlfriend in a major commercial district amid what authorities are describing as a rise in violent incidents in Haiti’s capital. mikenova shared this story from BBC News - World. Harassment against US diplomats by Russian security agents has been on the rise ever since sanctions were imposed two years ago, say officials. mikenova shared this story from World. Some prisoners appear to have been executed as Iraqi forces advanced. mikenova shared this story from BBC News - World. The BBC's Jeremy Bowen reports from the outskirts of Falluja, where the Iraqi army claims it has seized the last stronghold in the city, of the so-called Islamic State (IS). mikenova shared this story from World. Khaled Suliman Ahmed fled Fallujah in a wheelchair. mikenova shared this story from World. A group of lawyers, lawmakers and civil rights activists are urging authorities in Germany to investigate Turkish President Recep Tayyip Erdogan for war crimes and crimes against humanity. mikenova shared this story from World. Putin’s spokesman says Turkey’s president has apologized for the downing of a Russian military jet. mikenova shared this story from World. A Moldovan court has sentenced former Prime Minister Vlad Filat to nine years in prison on charges of taking bribes and influence trafficking. mikenova shared this story from Radio Free Europe / Radio Liberty. Russian opposition leader Aleksei Navalny says his jailed brother's request for early release has been rejected by prison authorities. » Are Russia’s Old Believers Set to Become a Political Player – Or Are They Being Played? mikenova shared this story from Radio Free Europe / Radio Liberty. On this week's Power Vertical Briefing, we discuss Russia's controversial new "antiterrorism" bill. mikenova shared this story from The Moscow Times Top Stories. A Russian governor arrested for corruption has claimed his innocence in a Moscow court. mikenova shared this story from NYT > Europe. The E.U. is flawed. But the dream is noble and still worth the fight. It did not deserve to be trashed by hucksters. mikenova shared this story from Stars and Stripes. A grenade exploded in a stadium in Madagascar, killing two people and injuring more than 80 in what authorities describe as a terrorist attack, authorities said Monday. mikenova shared this story from United States Defense and Military Forces. Readers say the Air Force must take responsibility, and a Vietnam veteran writes about his struggle to get service-related compensation for blindness. mikenova shared this story from Radio Free Europe / Radio Liberty. The top U.S. diplomat and NATO's chief say the military alliance is even more important now as a result of Britain's decision to leave the European Union. mikenova shared this story from World. Israeli police say young masked Palestinians threw stones and shot fireworks at police officers at a contentious Jerusalem holy site revered by Muslims and Jews. No injuries were reported. mikenova shared this story from World. An explosion in a stadium in Madagascar has killed two people and injured dozens in what authorities describe as a terrorist attack. mikenova shared this story from World. Afghan officials say the Taliban have killed at least five people from a group of eight abducted earlier this month from a bus in northern Kunduz province. mikenova shared this story from BBC News - World. A profile of stockbroker Brad Katsuyama, who devised a way to prevent the controversial practice of high frequency trading on the US financial markets. mikenova shared this story from BBC News - World. Iranians have taken to publishing their payslips online, angered by revelations that managers in some state companies enjoy surprisingly high salaries. mikenova shared this story from NYT > World. The assault last week killed seven members of the Jordanian security forces, said forces and wounded 13, a news agency that often serves as a conduit for reports about the group. group said. mikenova shared this story from Reuters: World News. BEIRUT (Reuters) - A number of suicide bombers killed six people and wounded 13 in an attack in a village in eastern Lebanon on Monday, Hezbollah's al-Manar TV reported. mikenova shared this story from WSJ.com: World News. Survivors and families of victims of the Pulse nightclub terror attack ask why the police rescue took so long. mikenova shared this story from Reuters: World News. BEIRUT (Reuters) - Islamic State claimed a suicide bomb attack launched from inside Syria on Tuesday that killed seven Jordanian border guards, its news agency Amaq said on Sunday. mikenova shared this story from BBC News - World. The so-called Islamic State group says it carried out a suicide attack that killed six Jordanian security personnel on the border with Syria. mikenova shared this story from Reuters: World News. ABOARD THE PAPAL PLANE (Reuters) - Pope Francis said on Sunday that Christians and the Roman Catholic Church should seek forgiveness from homosexuals for the way they had treated them. mikenova shared this story from BBC News - World. A grenade explosion kills at least two people and wounds dozens during Madagascar's national day celebrations in the capital, officials say. mikenova shared this story from Russia. Despite Moscow’s push to strengthen ties with Beijing, Russia-China trade has shrunk sharply. mikenova shared this story from Stars and Stripes. The former Navy SEAL who claims to have fired the shots that killed Osama bin Laden will go to trial in September on a drunken-driving charge. mikenova shared this story from GlobalSecurity.org. The Grand National Assembly of Turkey voted Thursday to not prosecute soldiers engaged in a crackdown on Kurdish separatist groups. mikenova shared this story from GlobalSecurity.org. According to reports, Russia and China signed deals to cooperate on the construction of a wide-fuselage long-range plane and a civil heavy-lift helicopter. mikenova shared this story from Stars and Stripes News. Fort Detrick is participating in a nationwide search for Zika-carrying mosquitoes as the virus spreads through countries with warmer climates. mikenova shared this story from World. A video has emerged showing Islamic State group militants killing five media activists who worked in an IS-held city in eastern Syria. mikenova shared this story from Voice of America. Edoardo Camilli, CEO at Hozint - Horizon Intelligence, says it's important for companies to be mindful of security, especially as they grow. mikenova shared this story from Radio Free Europe / Radio Liberty. Russia and China have signed a number of energy agreements during President Vladimir Putin's visit to Beijing.